Woman, because she was created by being drawn from man’s side, is constantly trying to return to him. She desires the original unity of one flesh and one bone. The desire for unity between man and woman is a mirror of the relationship between Christ and the soul. As woman longs for union with man in human relationships, she is also drawn to unity with God. He calls her to become one with Him: to come under His side and become flesh of His flesh and bone of His bone. This occurs during reception of Eucharist. The covering of the head with a veil symbolizes the reality of woman sheltered in the side of her Source and becoming one with Him. She becomes covered and hidden in her Divine Spouse. I found this quote soon after I decided to start veiling in 2010, and I thought it articulated perfectly the reason why. The quote was attributed to St. John Chrysostom. But considering how widely disseminated it was, including in Catholic blogs and a Catholic website solely dedicated to saint quotes, I didn't question the attribution. One day, however, it dawned on me that I had never actually seen or heard of any of St. John Chrysostom's works containing this quote. So I decided to research it. I emailed the webmaster of the Saint Quotes website but he didn't have any information on its origin. I also asked one of the priests at my parish who is very knowledgeable on the Church Fathers. I had no leads. At one point I contacted a blogger whose 2007 blog post contained the earliest mention of the quote I could find. She emailed me back saying she saw it in a pamphlet she received when she purchased a veil, but she could not remember which one it was. Finally, I asked God to lead me to the source of the quote, if He so pleased. Then, having done everything I could, I let it go, confident that He would answer my prayer. One day in November last year, I decided to look online and go in search of any pamphlet about the veil that I could find. And just like that, I found a booklet called "The Chapel Veil: Symbol of the Spouse of Christ" by Elizabeth Black and Emily Sparks. This booklet blew me away. It contained two essays that got to the very root of the meaning of the veil. To be honest, I had never encountered such a prayerful, in-depth explanation of the symbolism behind the chapel veil. It portrayed the theology of the veil in such a clear yet breathtakingly beautiful way that it renewed very powerfully in me my devotion for the Eucharist, my awe at the intimacy of the love of God, and my resolve to honor God in any way I could. This occurs during reception of Holy Eucharist, which is the consummation of the union between Christ and the soul. The covering of the head with a veil symbolizes the reality of woman sheltered in the side of her Source and becoming one with Him. This was my answered prayer! As it turns out, the original quote was not a direct quote by St. Chrysostom but rather an explanation of his theology of the veil. It didn't matter, though - it was beautiful and it spoke to my heart, as did the entire booklet. Since then, we have reprinted our veiling cards with the corrected attribution (with permission). We also ordered a couple hundred copies of this beautiful booklet. I want to share this booklet with you, and I want you to share it with others. I am now more convinced than ever that we need to "share the veil"! I can't wait to get this out there! 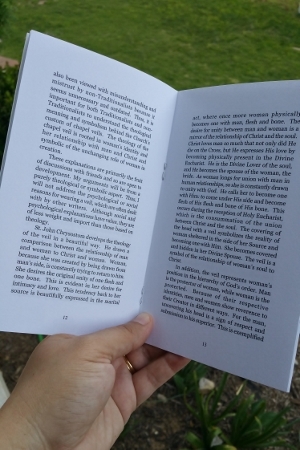 If you decide to order, please share the booklet once you have finished reading it. Maybe you can even drop it in a pamphlet rack at church. Let's share the veil, sisters!